The name says it all: Mum’s Kitchen is a proud preserver of Goan cuisine. They are an ambitious restaurant, and don’t fall under any usual banner. The restaurant takes a stand against the encroachment of fusionism that is seen at so many other restaurants in the state. I found Mum’s Kitchen to be intriguing and decided to pay a visit. Located in a quaint corner in Panjim, near Miramar beach, is a restaurant that serves one of the finest seafood varieties in all of Goa. 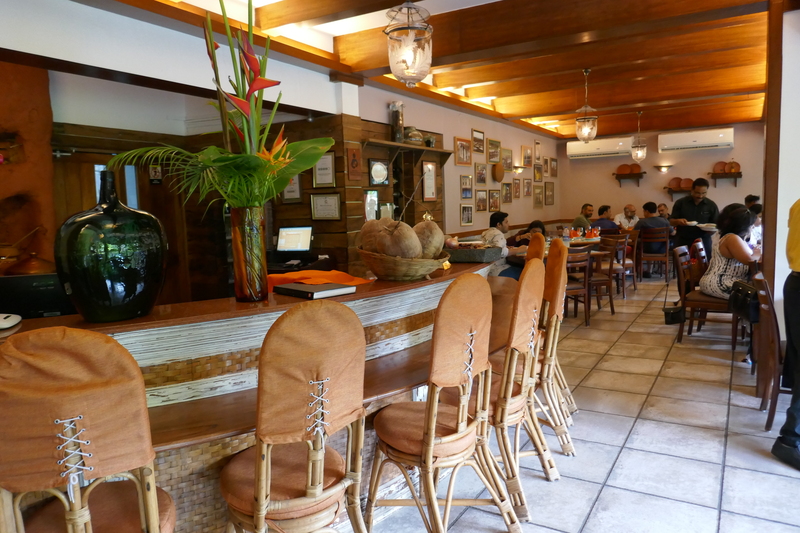 The place has a beautiful garden with fish ponds on either side of the track, which leads you to an air-conditioned restaurant. The ambience of the restaurant is true to its cuisine. There are wooden railings reflecting the Portuguese style homes while artifacts reflect a nostalgic era – coconuts in baskets, garafaos, rogdos (grinding stones) on the main area, they bring into focus the needs for Goa’s culinary art. Not to mention their Azulejo tiled tables that attracts the eye as soon as one steps into the restaurant. A good part of the space is taken up by the back kitchen, where Chef Vilasini and crew work at a fever pitch, cooking and plating their hearts out. The beauty is that the Head Chef was a utility worker with Rony and Suzette Martin. Her culinary abilities were top notch that Suzette decided to make Vilasini the head cook of Mum’s Kitchen. She trusted her capabilities and I guess it has worked wonders for the restaurant. One thing I loved about the restaurant is the character and charm each worker adds to the place. Remy is a master of the meet-greet-and-seat, and his sincere friendliness and big smile warmed my insides on a steamy afternoon. Sweeping us up in his enthusiasm, he talked us through the menu and within minutes returned to pour a delightful glass of the local drink. What fun! Talking about the menu, it is a mix of researched Hindu, Christian, Goan and Portuguese favourites. It is a blend of the past and present, to entice the diner to a culinary feast. I started with Foddi, an assorted vegetables fried with dry powdered masala and Suntachem Karwari, a dry preparation of prawns friend in onions, a tinge of saffron sprinkled with coconut. The starters and the dry seafood preparations are an excellent accompaniment with a stiff shot of the local brew – feni. I love the prawn preparation as it was moist, juicy and flavoursome. There is an ample choice of gravies, coconut based Hooman curry (Hindu Goan) or the rich orange Sungtachi Kodi (Christian Goan). Season or off season, every variety of fish -the Xec-Xec Masala with crabs, Chonak (sea perch cooked in the kodi), the kingfish tossed in peri-peri or the Hindu Goan style of masala, pomfret steaks and red snapper slices, lobsters with the recheiado, could be even de-shelled for the people’s convenience. Authentic Goan Food at Mum’s Kitchen – From the top Pau, Khatkhatem, Pamplet Kodi, rice and pappad-coconut salad. The menu felt like an endless list of options but I had to settle for something. I picked Pamplet Kodi, a pomfret curry made of coconut and spice paste. The best combination for this curry is a bowl of rice. The food was finger licking good, I savoured till the last morsel of rice in the bowl. Being a huge fan of seafood, I lapped up at the mere mention of lobsters. The Shivodache was rendition of lobster meat tossed in recheiado sauce, a typical Goan style dish. For all the vegetarians in the house, fret not, Mum’s Kitchen has enough and more vegetarian options to tickle your tastebuds. Many traditional Goans are vegetarian and it is from their kitchens that Keel Khatkhatem (bamboo shoots), Melgor (black-eyed beans), Bimbli Udamethi, are sourced. I tried Khatkhatem which was served with a warm Pau, a traditional Portuguese bread. What a wonderful amalgamation of dishes it was! It is a must try when you’re at Mum’s. By the time I finished the meal, I was full with food, but people who know me knew that there will always be space for dessert in my life. I ended the course of meal with Mangganem, a sweet delicacy prepared of gram dal, sabu danna, coconut milk and jaggery. Yum is the word! The secrets of Mum’s Kitchen are however, held by the dear Mothers of Goa. Their entire menu is a compilation of recipes from various “MOTHERS” from different parts of Goa. The restaurant takes every effort to sustain the genuineness and quality of each recipe, and to bring on to the table some very sumptuous dishes. A final thing to consider if you’re already dialing Mum’s Kitchen number to make a reservation: the cost. Lunch or Dinner for two would cost around Rs.2000 including drinks. It is a couple and family friendly restaurant. Mum’s Kitchen doesn’t feed you just food, they feed you happiness and contentment as well. When you step out of the restaurant, you have not just dined at the place but you have been a part of their ethnic cuisine movement to preserve Goan’s tradition. This place is definitely a food for thought and tummy!